A stunning strike from Kevin Braniff saw Glenavon recover from a goal down to beat Dungannon Swifts on Tuesday night at Mourneview Park. Braniff’s moment of magic came early in the second half as he drove the ball past Andy Coleman to make it 2-1. After a slow start Glenavon fashioned the first chance with Braniff expertly bringing the ball down but his final shot lacked power to trouble Coleman. A few minutes later Declan O’Brien teed up Braniff but his firmly struck shot flew just wide. 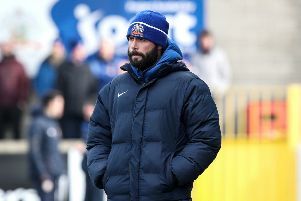 It then became rather pedestrian with neither side able to break defences down but on 27 minutes Glenavon went close again when Conor Dillon’s free kick was half cleared to Shane McCabe, he lobbed the ball back in and O’Brien’s flick fell to Ciaran Martyn but he could not poke the ball past the keeper. The visitors then carved out the opener, Jamie Douglas and Matt Hazley linked up to set up Ryan Harpur who fired past James McGrath - 1-0 to the Swifts on 30 minutes and the tenth time in a row they have struck the first goal against the Lurgan Blues. That lead was to last just seven minutes as Rhys Marshall levelled from close range as he nodded in a corner from Kyle Neill. Dungannon made a great start to the second half catching the Blues napping as Douglas hit the base of the post with a low drive. A lovely bit of skill saw Glenavon take the lead on 51 minutes. O’Brien chested the ball into the path of Braniff and the striker smashed a crisp left foot show into the corner of the net. On 66 minutes Braniff set up a great chance but the ball spun away from him as he was about to shoot and O’Brien scuffed the loose ball allowing Coleman to clear. Glenavon kept pressing to the end and could have added to their tally, but in the end 2-1 was enough to secure the win. Glenavon: McGrath, Neill, Murphy, Dillon, Caldwell, O’Brien, Marshall, Braniff, McCabe, Martyn, Singleton. Subs: Lindsay, Kilmartin, Hamilton, Bradley, Patton.